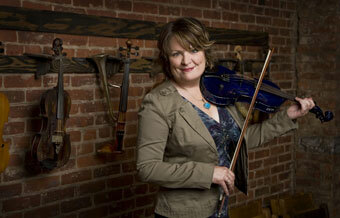 Dubbed a "sensation" by Billboard magazine and "the Jimi Hendrix of the violin" by The New York Times, Eileen Ivers is a great innovator in the Celtic and world music genres. One of the most eminent exponents of the Irish fiddle in the world today, her impressive list of accomplishments includes nine All-Ireland Fiddle Champion wins, a starring original role in Riverdance, Grammy Awards, numerous movie scores, and playing with everyone from the London Symphony Orchestra to Sting to Cherish the Ladies, of which she was a founding member. Not to mention being one of the most electrifying fiddlers around! Appearing tonight with Immigrant Soul, Eileen presents music full of life and spirit, woven into a vibrant, seamless fabric by artists from different backgrounds. Percussionist Tommy McDonnell, button accordion champion Buddy Connolly, multi-instrumentalist Greg Anderson, and bassist Leo Traversa join Eileen in a boldly imaginative, virtuosic exploration of the tradition and future of the Celtic fiddle. The daughter of Irish immigrants, Eileen grew up in a culturally diverse neighborhood in the Bronx, New York. While rooted in Irish traditional music since the age of eight, Eileen's immersion in the different genres of music which she experienced growing up in New York has informed her passion for seeking parallels in various traditional music styles. Steeped in tradition yet highly adventurous, Eileen's playing bridges the gap between her roots and styles ranging from jazz, salsa, and flamenco to rock and funk. Her most recent CD is Beyond the Bog Road, a celebration of the Irish immigrant's impact on America and America's impact on the Irish immigrant.